THE KINGS OF SUMMER reigns over all this summer’s blockbusters writes Timothy E. RAW, who also talked to director Jordan Vogt-Roberts earlier this year at Sundance London. Here's something you don't see everyday. A summer movie with no big stars, that's in no way beholden to its budget and decidedly lacking in green screen. Though it's worth noting a randomly exploding car, the film's one concession to Bay-atrics. Hell, it is blockbuster season after all. Funny or die skit-man Jordan Vogt-Roberts' sugarfied updating of eighties coming of ages classics Stand by Me and The Goonies, concerns three misfit kids running away from home, and the debut feature director works wonders in evoking the reckless summer abandon that children of a pre-internet age once felt. Tapping into a time before multiplex mind-numbing, face-chatting and i-Droning, this is one of those summers of more innocent, adventurous times, spent roaming the woods, building forts and reenacting the films and Nintendo games rented from the local video shop the night before. The Kings of Summer is full on Amblin Americana in its Dante-esque evocation of The Burbs, but it remains instantly recognizable and relatable to eighties kids on this this side of the ocean as well. For me personally, it specifically recalled the time my cousin Tom and I decided to run away from home in order to teach our parents a lesson about grounding us, never mind that I was still wheelchair bound back then. Such a hastily considered course saw us stocked up on a month's supply of Chewits but no water, sleeping bags but no tent, and all but one change of clothes. Needless to say we lasted only six hours (okay, four) before returning home and getting one of the biggest scoldings of my life. That same flippancy of bad decision-making informs 15-year-old Joe Toy's (Nick Robinson) getaway after he's had just about all the belittlement he can take from his widowed father, still dealing with the loss of his wife by not so passive aggressively taking it out on his son. Best mate Patrick (Gabriel Basso) just so happens to be at his breaking point too, nagging parents continually talking at him as if he isn't in the room, and in the same baby voice they probably put on when feeding him his food via choo-choo train. Awkwardly growing into their own bodies (a discomfort exasperated by disapprovingly hilarious comments from the heads of both households), both boys appear to have recently shot up in size, developing muscles and facial hair where there wouldn't have been much of either the previous summer. 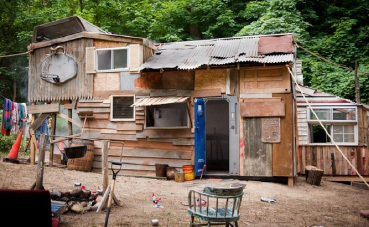 Micro-managed and mollycoddled, exasperation leads Joe and Patrick to living out in the woods in a built-from-the-ground-up house of their own, where they can act like men and not be treated like boys. The house itself is a beautiful ramshackle construction; just feasible enough to inspire envious childlike awe in all former fort builders who wished their own rickety wooden dens looked half as good. With slides, poles and portaloo doors (oh to have had such building materials) it resembles a many-splintered skeletal frame of a Teenage Mutant Ninja Turtles playset brought to life size dimensions. As much a character as its titular trio, the film once went by the title of Toy's House, which is still preferred by Roberts. The clearing of their construction site is where we encounter bug-eyed Biaggio (a scene stealing Moises Arias), the local weirdo happy to play third wheel whether Joe and Patrick want him too or not. Most likely dropped on his head as a child, his bizarre non-sequiturs scupper serious talk of survival tactics, but it is he who hunts their chicken at the Boston Market across the street rather than pathetically play at Lord of the Flies, and it is he who is ultimately more committed to seeing their summer of escapism through than either Joe or Patrick, movingly proving what a loyal and true friend he is by the pictures' end. Arias' extraordinary comic timing, accented by alien abductee line readings and all-limbs physicality is a livewire performance that draws the eye in every frame. From the moment he's first seen dancing atop a pipe, throwing shapes in perfect time to the rhythm erratically beat out with sticks by Joe and Patrick, it's immediately apparent that this is a star turn. Biaggio is an instantly iconic comic creation, and it really would come as no surprise if he later finds himself quoted in dorm rooms across America and printed on t-shirts along with the likes of Napoleon Dynamite's Pedro and Superbad's McLovin, though it's a more studied, convincing turn than either and far funnier. 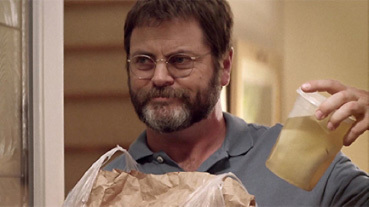 Kings has as many laughs as Man of Steel has explosions, Arias earning guffaws for every other line, though he's more than matched by Nick Offerman AKA Parks and Recreation's Ron Swanson, whose delivery is so deadpan it forgets the pan altogether. No feature-length comedy until now has ever really understood the best way to use Offerman, always in a different register to lesser material, but Roberts, coming from the more haphazard side of improv, knows to let his actor play. Berating a deliveryman for the local Chinese takeout's over sized wantons is a brilliantly off the cuff moment of farcical belligerence and the funniest piece of acting I've seen all year. Now that his son's not around, someone has to take the brunt, though clearly this hostility arises from how much Joe's father misses his boy. Offerman has that rare ability of being able to be both cruel and warm – often at once – and it's used to uproarious effect here. Though its mood and feeling dwells in a bygone era of free range childhoods, stylistically and musically, The Kings of Summer is thoroughly modern. In place of Thin Lizzy's Jail Break, the ultimate anthem of summer rebellion, (which Roberts has put on record as a source of inspiration), the film is drenched in hip-hop swagger and sweaty, agitated cutting, with stylistic flourishes that play at times like Danny Boyle's videogame sequence in The Beach. This of course is perfectly appropriate. In the absence of consoles, the boys are their own avatars in the videogame of their making. If unreality is overcranked to the point where it seems impossible to see the points of connection with the far more leisurely, understated Amblin influences of old, the one commonality Roberts hits on is that ineffable magic of being able to take us back to a time where the only limit to adventure was one's imagination, where almost every "first" – big or small – felt significant and worth remembering. For all their big budget wizardry, this is a feeling for which no effects house in the world has an algorithm. Director Jordan Vogt Roberts talks to Timothy E. RAW for Cine Outsider about The Kings of Summer at the 2013 Sundance London Film and Music Festival. This video has been optimised to play full screen at 720p.